I was recently given a rosary of a type I didn't have before, which always makes me happy. This time it's a rosary of plain knotted cord -- no beads at all. Whether knotted-cord rosaries were the "first" Christian prayer counters is debateable. But they are clearly worth considering, since in any era they would likely have been the mainstay of the poor and devout, who probably couldn't have afforded beads at all. Such a person would have made their rosary from whatever bit of string was available -- very likely a simple flax (linen) or hempen cord. The knots are potentially interesting. While any old knot would undoubtedly serve the purpose as a signal for the fingers, there is a "traditional" knot that is often used: a variation on the plain overhand knot, made with multiple "wraps" rather than just one. It actually doesn't seem to have a standardized name; I learned it as a "bullion knot", since it's the basis of the bullion stitch in embroidery. The bullion knot appears in the hanging part of the knotted rope, where it's easy to recognize by its shape and the multiple wraps of the cord. 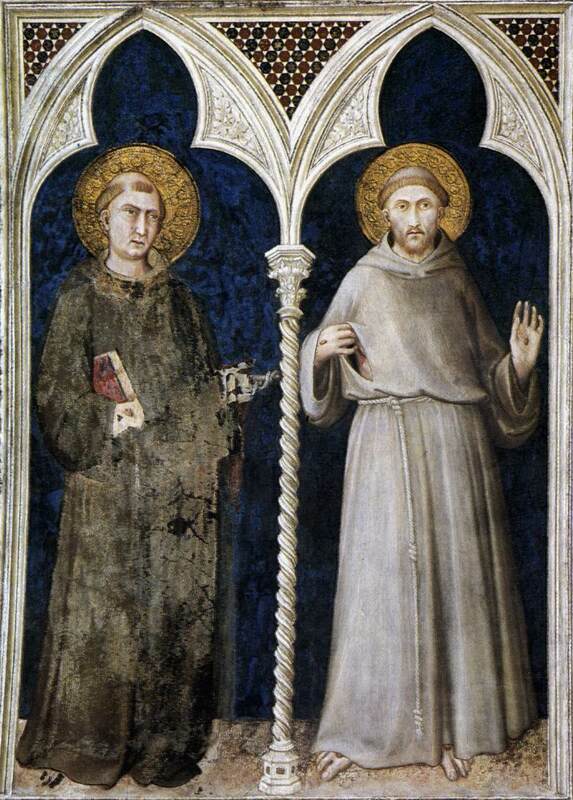 A detail often overlooked is that Franciscan friars wear their cord with three knots in it, symbolizing the three vows of poverty, chastity, and obedience. The Poor Clares, who are cloistered Franciscan nuns, wear four knots (the fourth symbolizing their vow of enclosure) and Third Order or Secular Order Franciscans wear five knots for the five wounds of Christ. 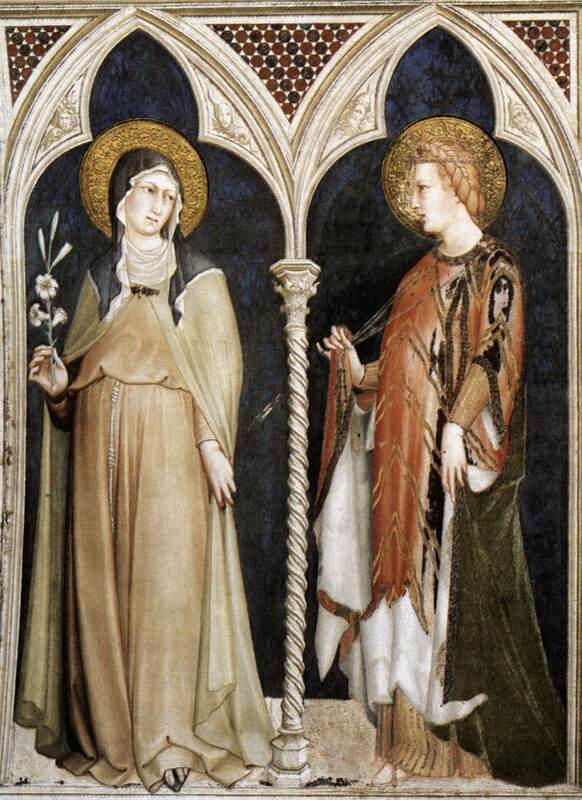 You can see some examples in Giotto's frescos for the church of San Francesco in Assisi here and here, and Saint Clare here in the Altarpiece of Saint Clare (ca. 1280), and here, by Simone Martini in 1317. Probably the best instructions I've seen for making a knotted cord rosary are here, from Rosary Shop online. These include a nice diagram of how to tie the knot. It needs to be tightened carefully in order to look neat and orderly. There are also instructions here. The rosary I received was made by the leaders of a religious retreat I attended (thanks, Erin! ), and all of us who participated were invited to choose one. The most common modern material for these is three-ply nylon cord, which comes in a wide variety of colors from white and pastels to screaming fluorescent yellow, red, and multicolored mixes. Most aren't to my personal taste, but I picked out one in red, green and white for my collection as a nice, bright-colored example. Protestants IV: Can Protestants hail Mary?